Creditcane™: I will not be broken. I have been trained by the best. Spinning top day (evening star forming?). Midpoint above EMA(10). Held SMA(144). Tested and failed the 61.8% minor retrace (1286.32). New high on daily 3LB (reversal is 1238.25). QE2infinity. Had a weekly reversal up. Bullish harami day. 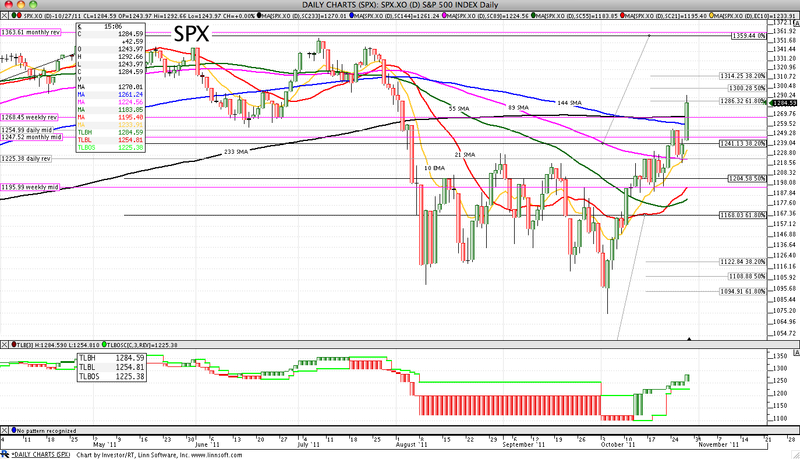 Midpoint below EMA(10). Tested and held the 61.8% minor retrace (74.94). Failing SMA(144). No daily 3LB changes (reversal is 76.62). Not confirming the monthly 3LB reversal up. Bearish long day. Midpoint below EMA(10). Tested and failed SMA(144). Failing its 61.8% retrace (26.16). 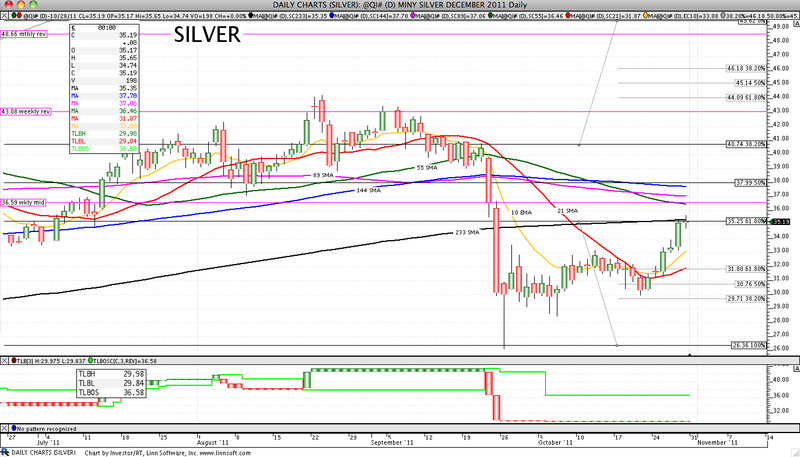 Daily 3LB reversal down (reversal is 48.00). Still running from the "fear" zone. Bearish harami day. Midpoint above EMA(10). 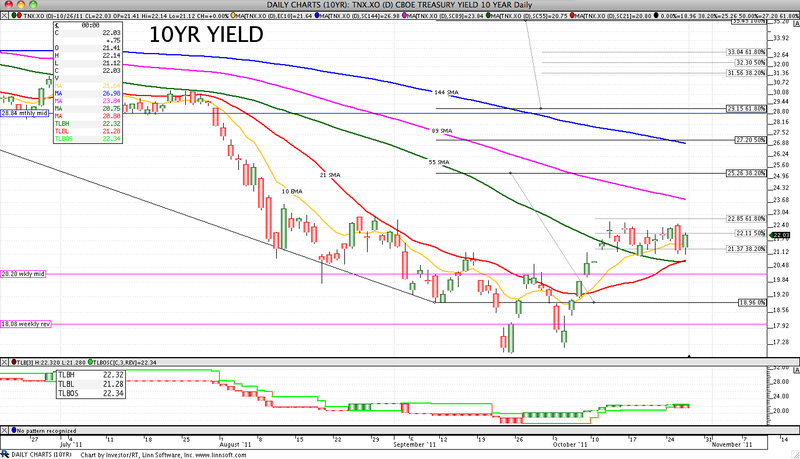 Held its 38.2% retrace (1714.40). Tested and held SMA(55). 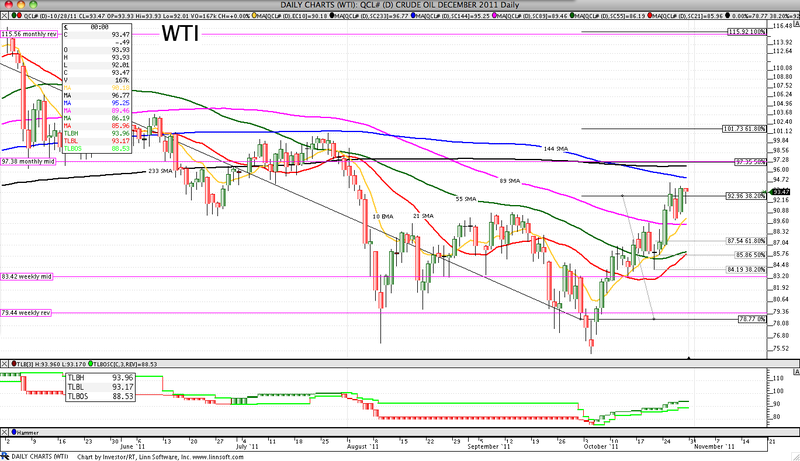 No daily 3LB changes (reversal is 1757.30). Still above daily 3LB mid. Must have the precious. Bearish harami day. Midpoint above EMA(10). Tested and failed SMA(144). 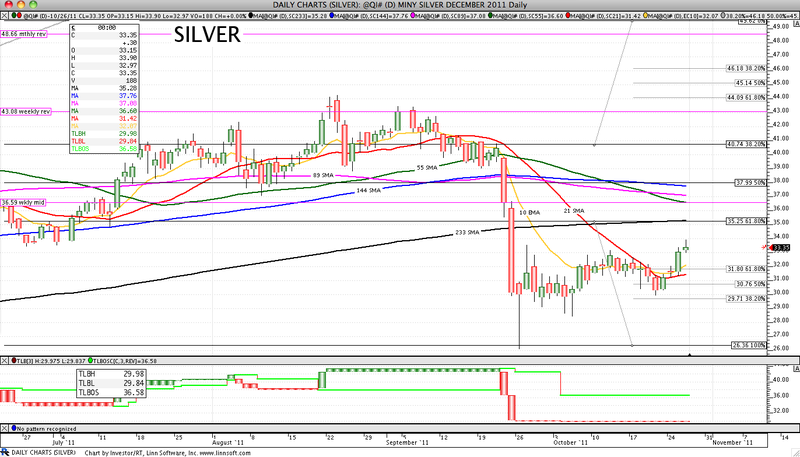 Held above its 50.0% retrace (1.4056). No daily 3LB changes (reversal is 1.3779). Spinning top day. Midpoint above EMA(10). Tested and held SMA(144). Failing its 38.2% minor retrace (39.62). No daily 3LB changes (reversal is 37.74). Bearish harami day. Tested and failed SMA(89). Midpoint above EMA(10). Tested and held its 61.8% minor retrace (22.85). No daily 3LB changes (reversal is 21.28). Hanging man day. Held above SMA(89). Midpoint above EMA(10). 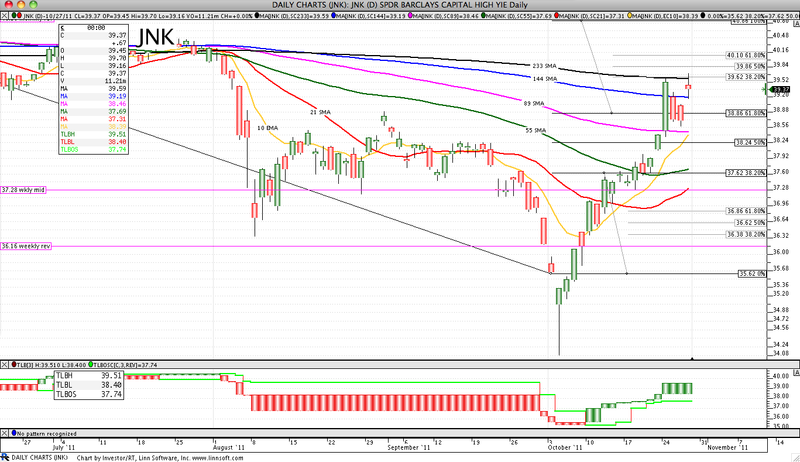 Tested and held its 38.2% retrace (92.96). 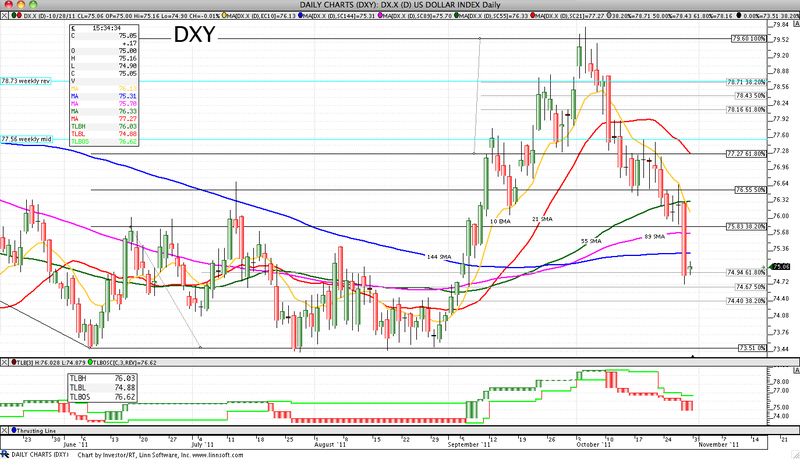 No dally 3LB changes (reversal is 88.53). Not confirming the monthly 3LB reversal down. Doji day (evening star forming?). Tested and failed SMA(233). Midpoint above EMA(10). 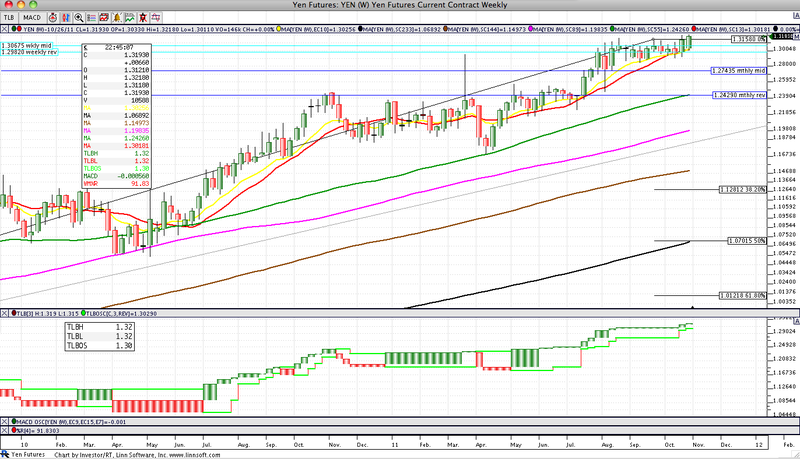 Tested and matched its 61.8% retrace (35.25). No daily 3LB changes (reversal is 36.58). Bearish harami day. Midpoint above EMA(10). Held above SMA(89). 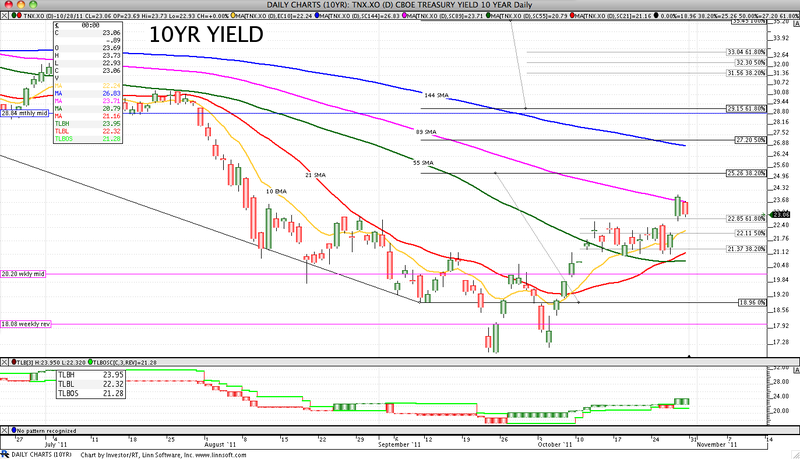 Tested and held its 38.2% retrace (41.37). No daily 3LB changes (reversal is 36.51). Bearish short day. Failing SMA(144). Midpoint above EMA(10). Failing its 50.0% retrace (0.7942). No daily 3LB changes (reversal is 0.7730). Bearish short day. 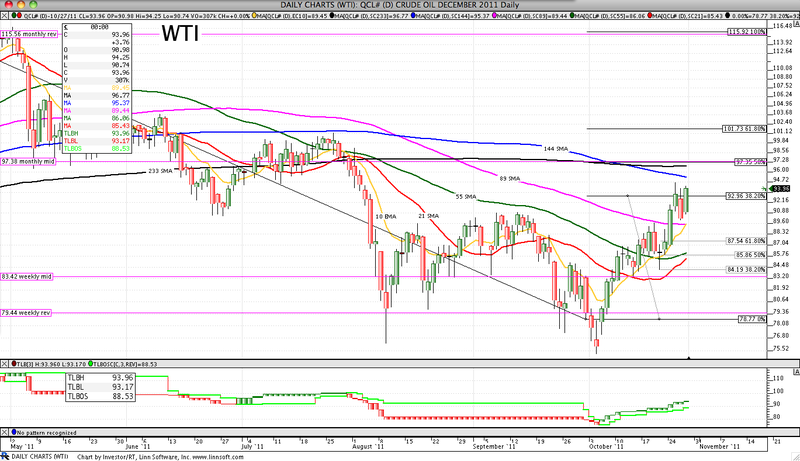 Midpoint below EMA(10). Failing all SMA's. Tested and failed its 50.0% retrace (75.805). New low on daily 3LB (reversal is 76.05). BOJ losing sleep again. This chart is saying that the BOJ is losing much sleep. It's back above its 0.0% retrace. It's still above all SMA's. It's making another weekly 3LB high. How long can they hold out before intervening? This cross is not moving in the direction the SNB wants it to. The move down has been gradual for now. Probably won't see any move from the SNB until it starts approaching the peg. 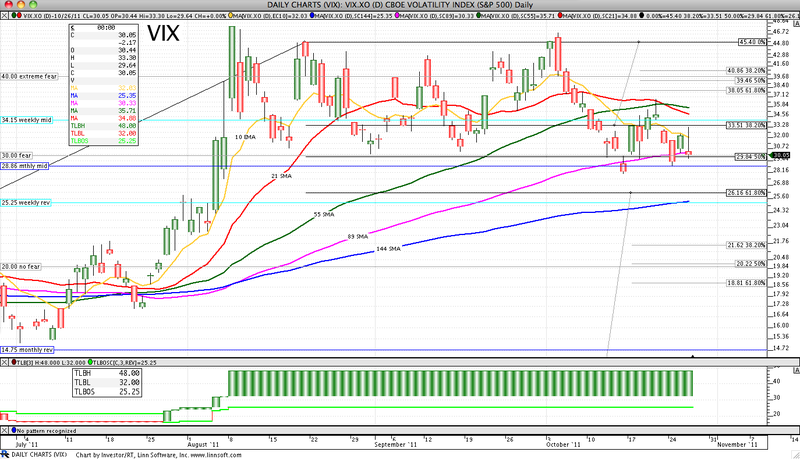 It tested and failed the SMA(55) and 38.2% retrace three times. Creditcane™: I was ambushed by the EU BS. Bullish long day. Midpoint above EMA(10). Tested and held SMA(144). Tested and failed the 61.8% minor retrace (1286.32). 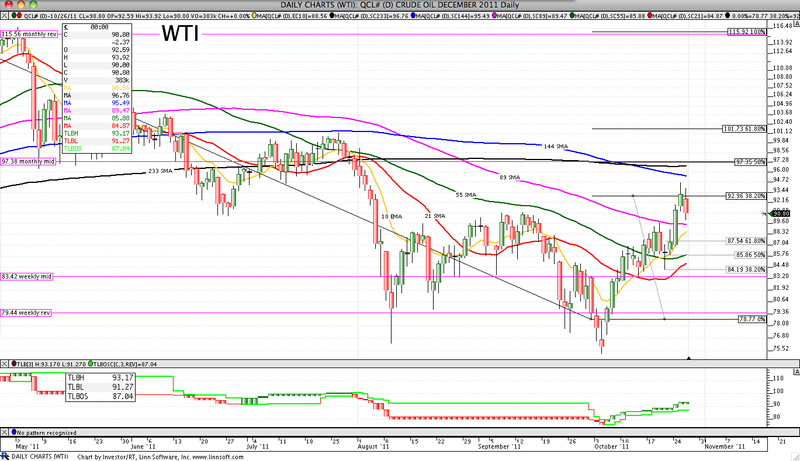 New high on daily 3LB (reversal is 1225.38). QE2infinity. Now above weekly rev and monthly 3LB mid. 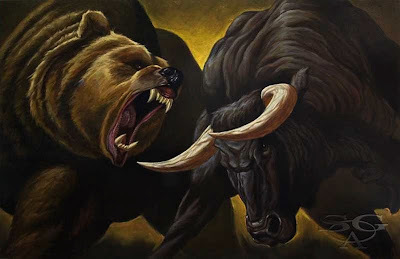 Bearish long day. Midpoint below EMA(10). 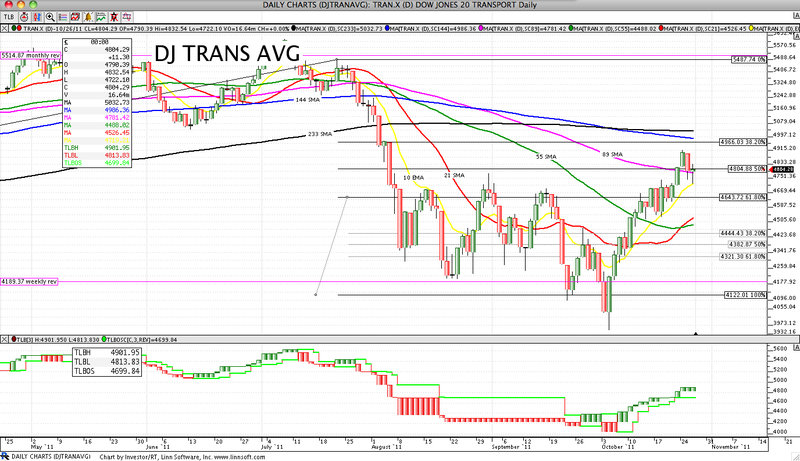 Tested and failed the 38.2% retrace (75.83). Tested and failed SMA(144). New low on daily 3LB (reversal is 76.62). Not confirming the monthly 3LB reversal up. Bullish short day. Midpoint below EMA(10). 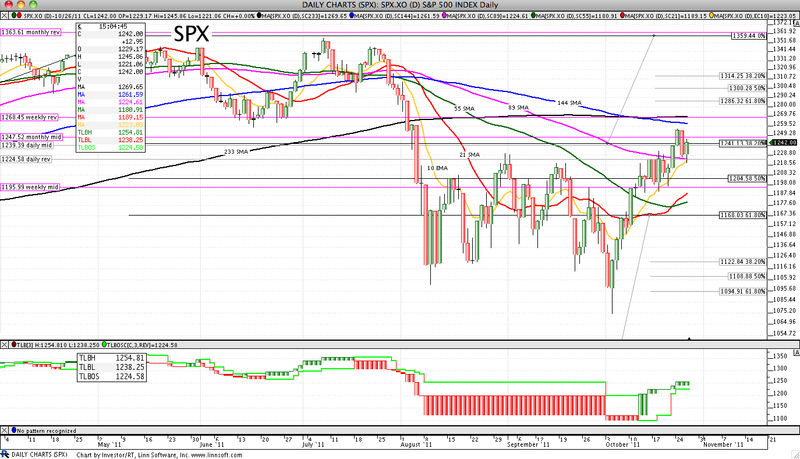 Tested and held SMA(144). Tested and failed its 61.8% retrace (26.16). No daily 3LB changes (reversal is 25.25). Another escape from the "fear" zone. Bullish short day. Midpoint above EMA(10). 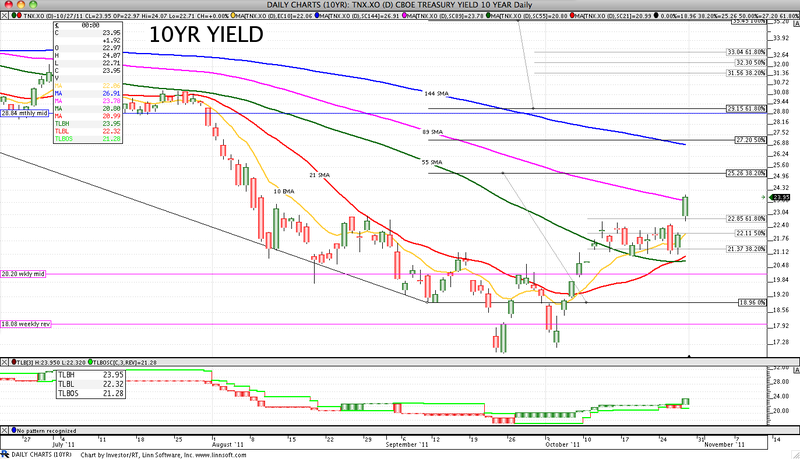 Tested and held its 38.2% retrace (1714.40). 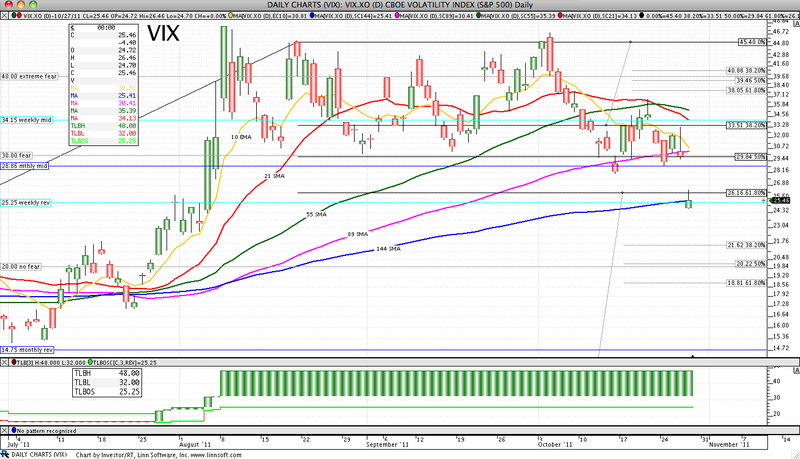 Held above SMA(55). 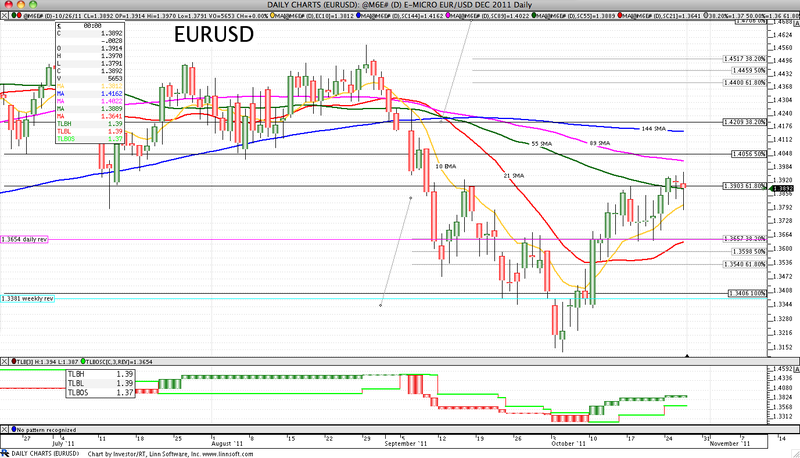 No daily 3LB changes (reversal is 1757.30). Still above daily 3LB mid. Must have the precious. Bullish long day. Midpoint above EMA(10). Tested and held SMA(144). 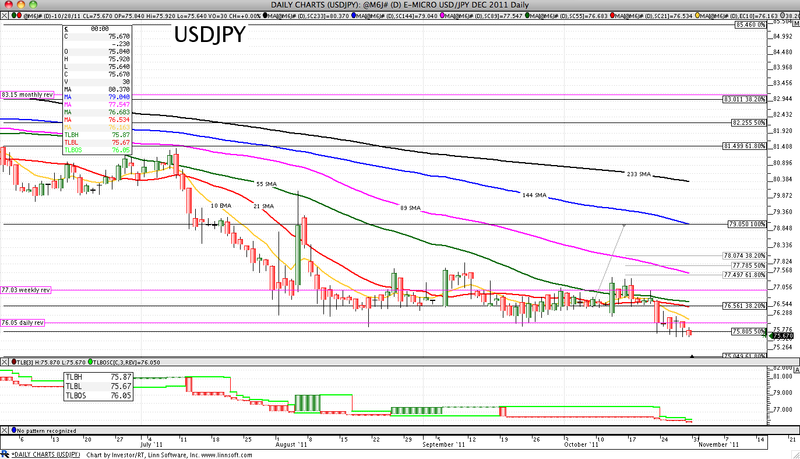 Tested and held its 50.0% retrace (1.4056). New high on daily 3LB (reversal is 1.3779). Spinning top day. Midpoint above EMA(10). 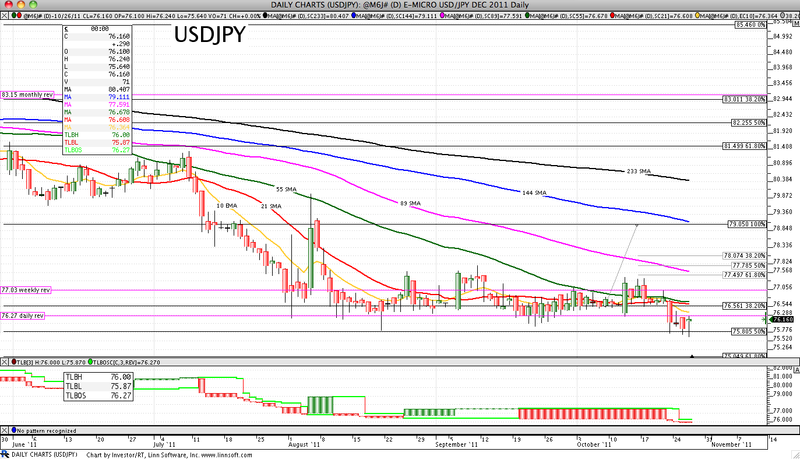 Tested and held SMA(144). Tested and failed its 38.2% minor retrace (39.62). No daily 3LB changes (reversal is 37.74). Bullish long day. Tested and held SMA(89). Midpoint above EMA(10). Tested and held its 61.8% minor retrace (22.85). 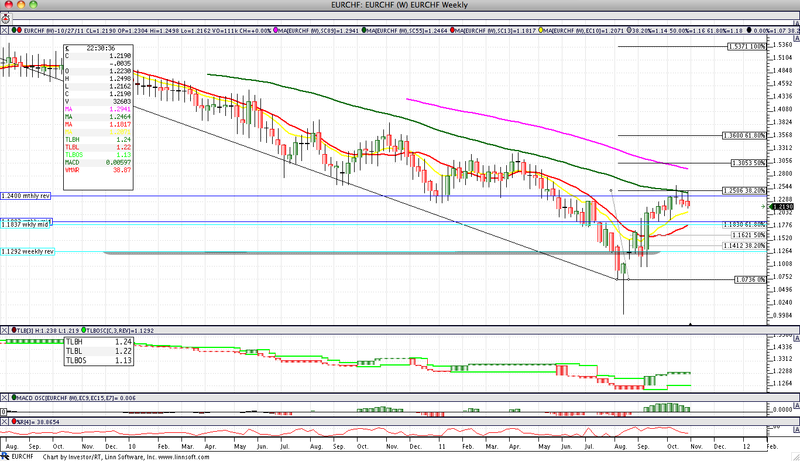 Daily 3LB reversal up (reversal is 21.28). Bullish long day. Held above SMA(89). Midpoint above EMA(10). Tested and held its 38.2% retrace (92.96). 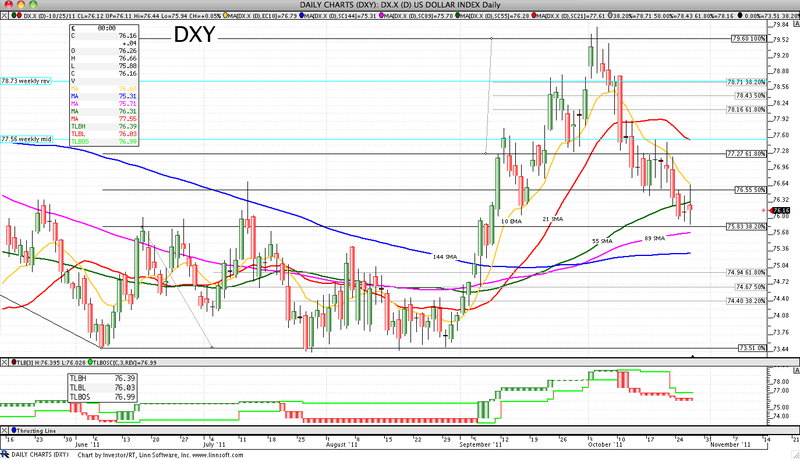 New high on dally 3LB (reversal is 88.53). Not confirming the monthly 3LB reversal down. Bullish long day. 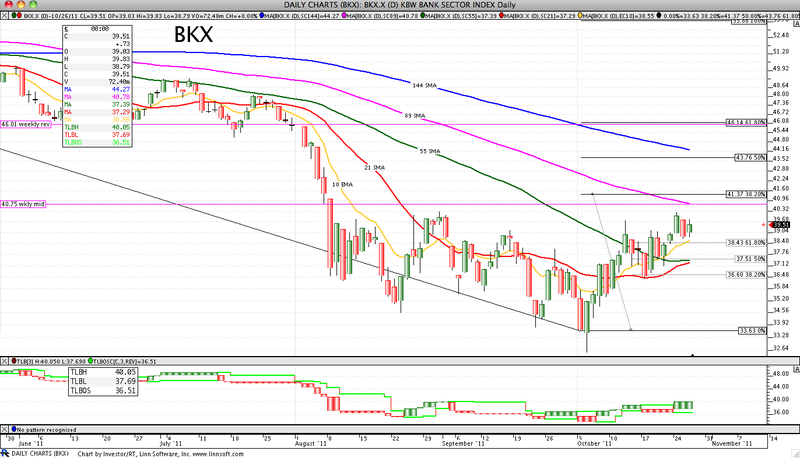 Held above SMA(21). Midpoint above EMA(10). Tested and failed its 61.8% retrace (35.25). No daily 3LB changes (reversal is 36.58). Bullish long day. Midpoint above EMA(10). Tested and held SMA(89). 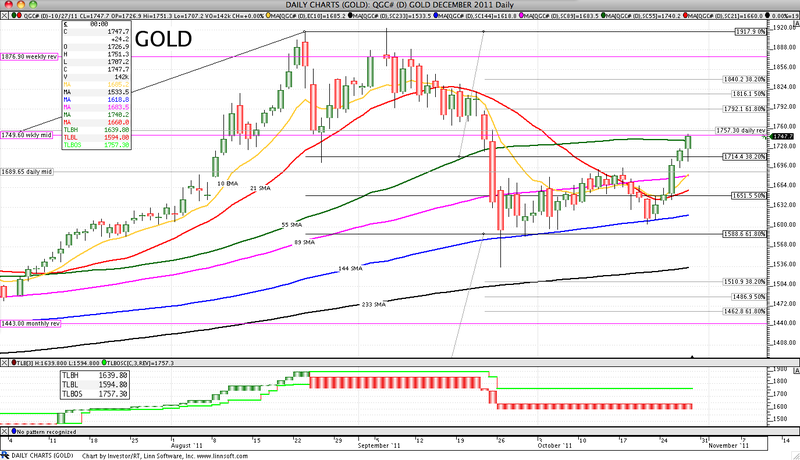 Tested and held its 38.2% retrace (41.37). New hinge on daily 3LB (reversal is 36.51). Bearish long day. Tested and failed SMA(144). Midpoint above EMA(10). Tested and failed its 50.0% retrace (0.7942). No daily 3LB changes (reversal is 0.7730). 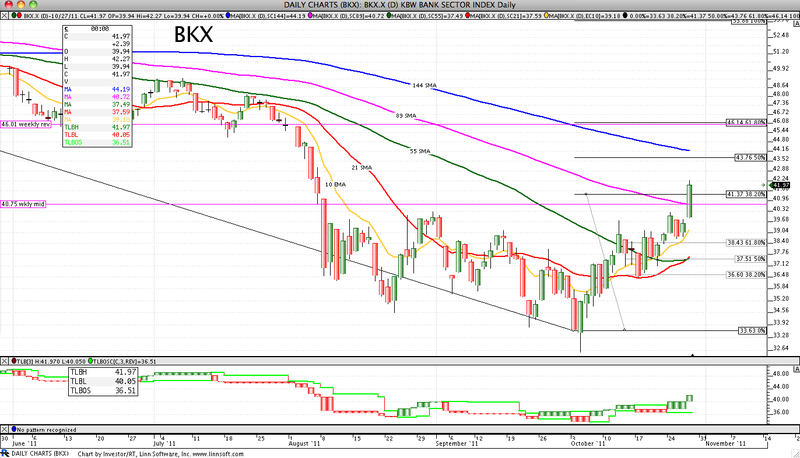 Bearish short day. Midpoint below EMA(10). Failing all SMA's. Tested and held its 50.0% retrace (75.805). No daily 3LB changes (reversal is 76.27). BOJ losing sleep again. Bullish long day. Midpoint above EMA(10). Tested and held SMA(55). 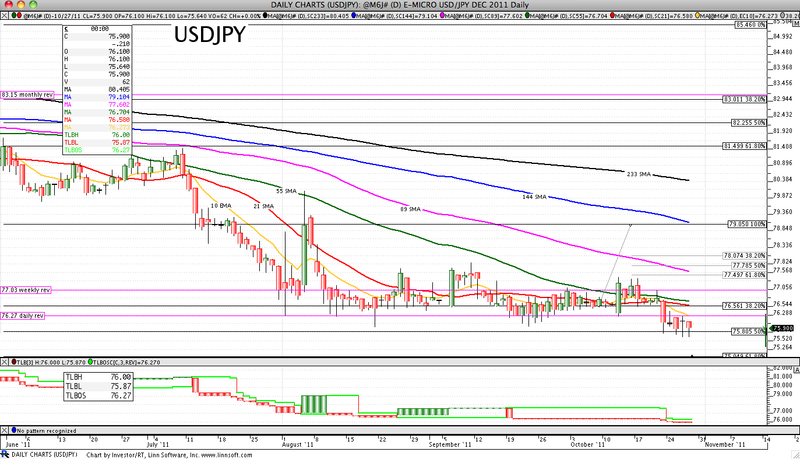 Tested and held its 38.2% retrace (3.673). New high on daily 3LB (reversal is 3.258). The long bond is showing weakness. It's trying to hold the SMA(13). 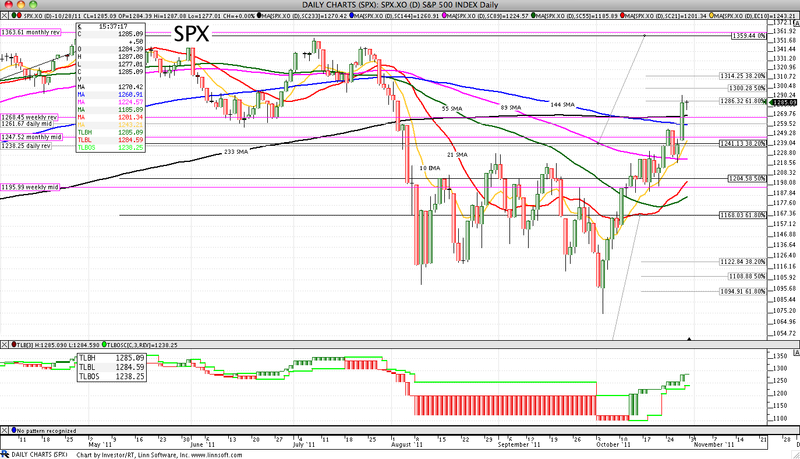 It's failing to get above the midpoint of the long bearish candle from a couple of weeks ago. Operation Twist is about to get twisted. 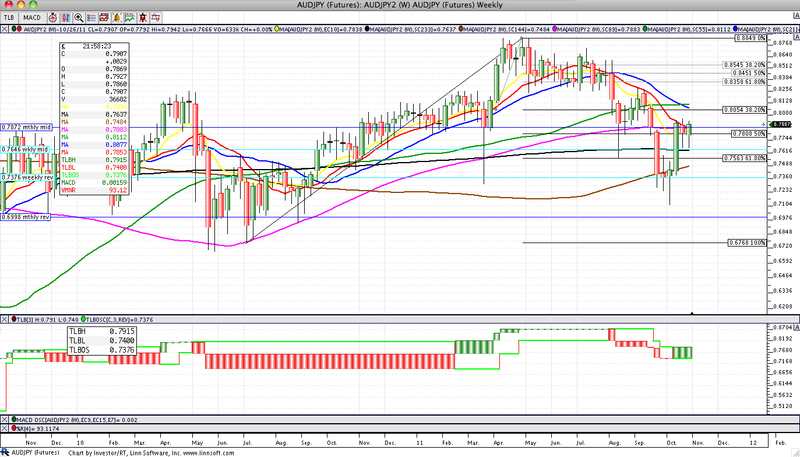 The AUDJPY is trying to hold its SMA(21), monthly 3LB mid and 50.0% retrace. It appears some traders are believing the BS coming out of the EU Summit.This weeks candle is bullish but small indicating there's no confidence in the move. We'll see. 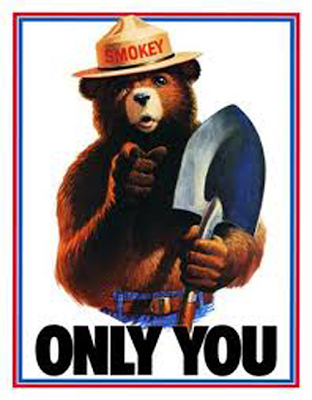 ...can prevent market melt ups based on BS rumors. Creditcane™: Another day of Talkin' Loud and Saying Nuthin' that somehow is kryptonite to my destructive forces. Bullish short day. Midpoint above EMA(10). Tested and held SMA(89). Tested and held the 38.2% retrace (1241.13). 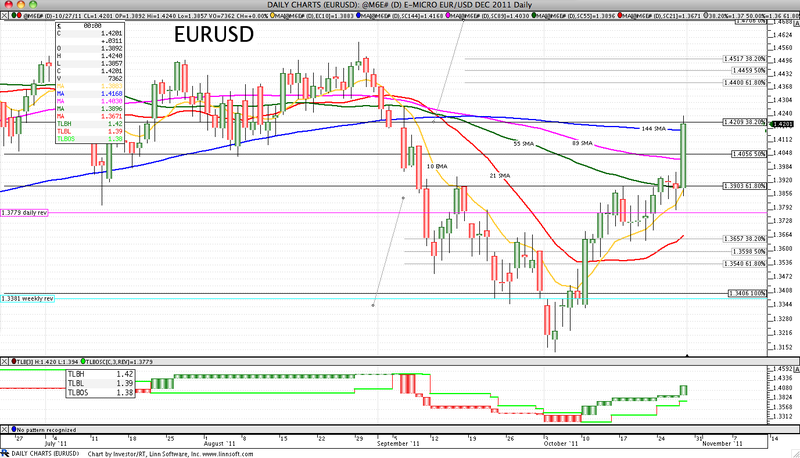 No daily 3LB changes (reversal is 1224.58). QE2infinity. Back above daily mid but still below monthly 3LB mid. Spinning top day (yet confirmed bullish harami). Midpoint below EMA(10). Failing the 50.0% retrace (76.55). Tested and failed SMA(55). No daily 3LB changes (reversal is 76.99). Not confirming the monthly 3LB reversal up. Bearish short day. Midpoint below EMA(10). Tested and failed SMA(89). Tested and held its 50.0% retrace (29.84). No daily 3LB changes (reversal is 25.25). Captured and returned to the "fear" zone. Bullish short day. Midpoint above EMA(10). 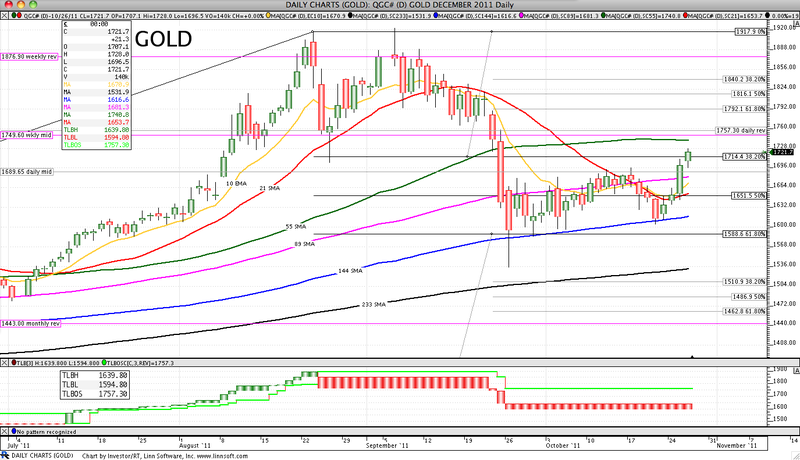 Tested and held its 38.2% retrace (1714.40). 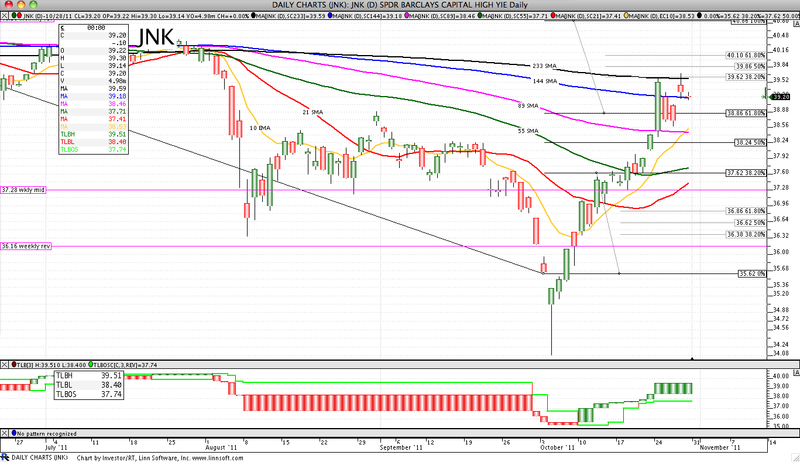 Held above SMA(89). 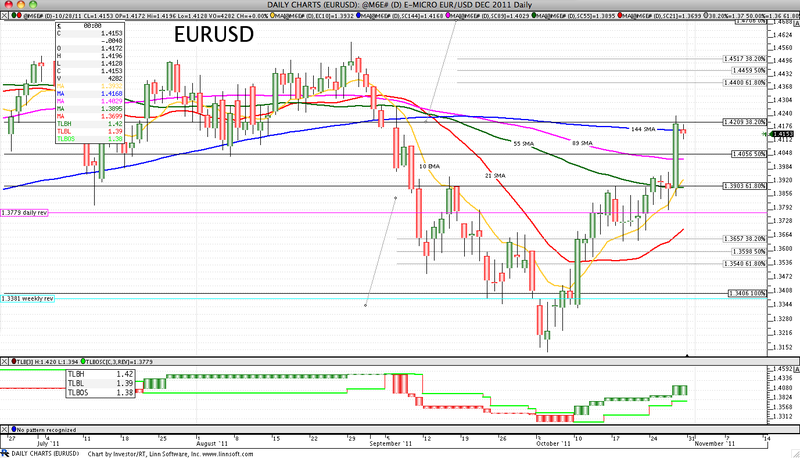 No daily 3LB changes (reversal is 1757.30). Still above daily 3LB mid. Must have the precious. 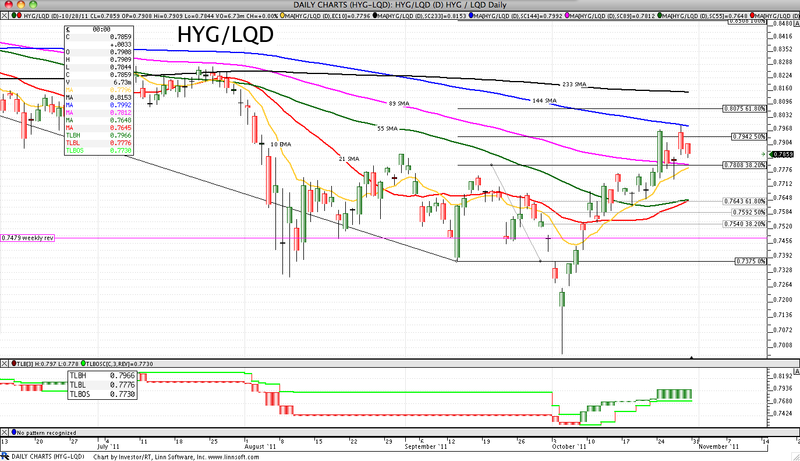 Spinning top day (yet confirmed bearish harami). Midpoint above EMA(10). Tested and held SMA(55). Tested and failed its 61.8% retrace (1.3903). No daily 3LB changes (reversal is 1.3654). 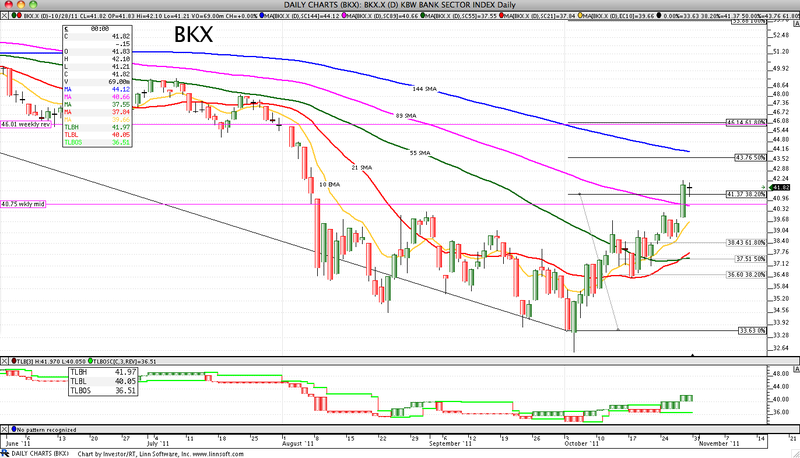 Bearish short day (barely confirmed bearish harami). Midpoint above EMA(10). Failing SMA(144). Tested and failed its 61.8% retrace (38.86). No daily 3LB changes (reversal is 37.74). Bullish short day (didn't confirm bearish engulfing). Holding above SMA(55). Midpoint above EMA(10). 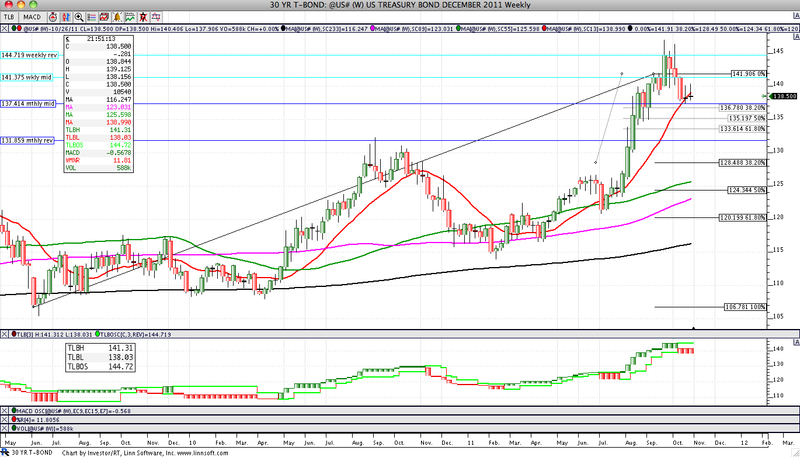 Tested and held its 38.2% minor retrace (21.37). No daily 3LB changes (reversal is 22.34). Bearish short day. 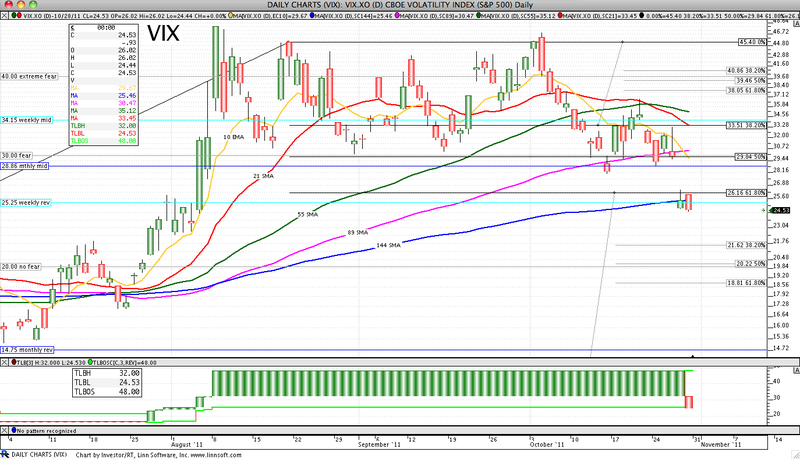 Held above SMA(89). Midpoint above EMA(10). 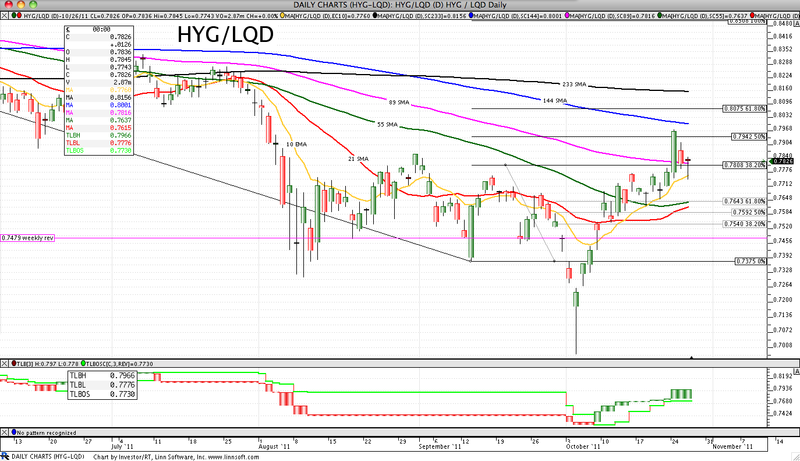 Tested and failed its 38.2% retrace (92.96). 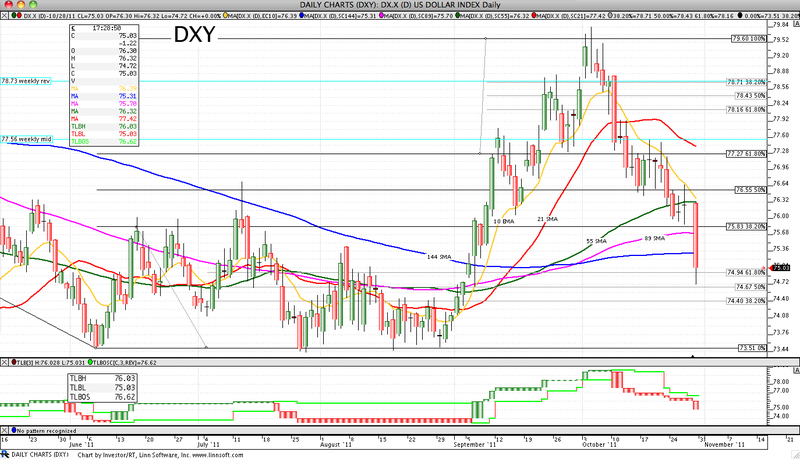 No dally 3LB changes (reversal is 87.04). Not confirming the monthly 3LB reversal down. Spinning top day. 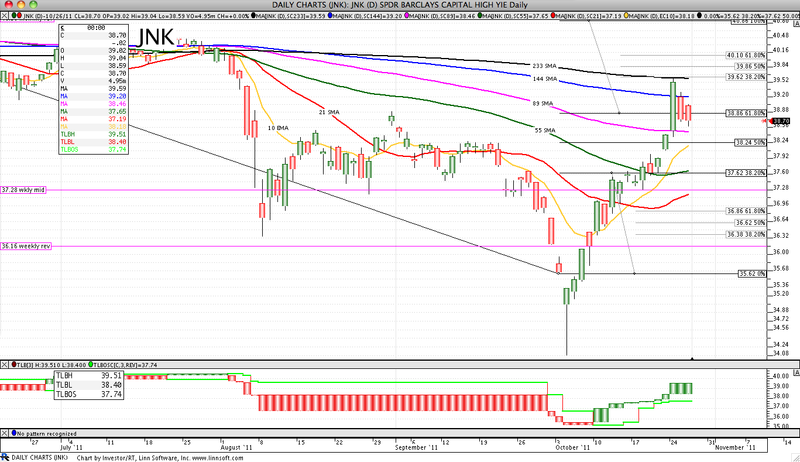 Held above SMA(21). Midpoint above EMA(10). 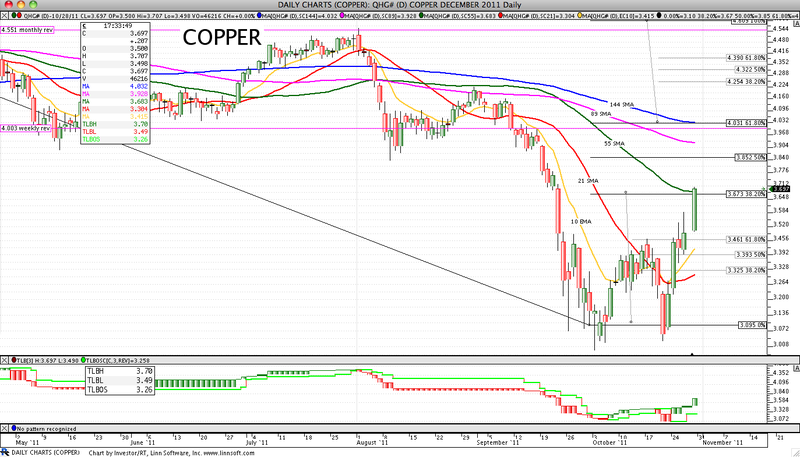 Held above its 61.8% minor retrace (31.80). No daily 3LB changes (reversal is 36.58). Spinning top day. Midpoint above EMA(10). Holding above SMA(55). 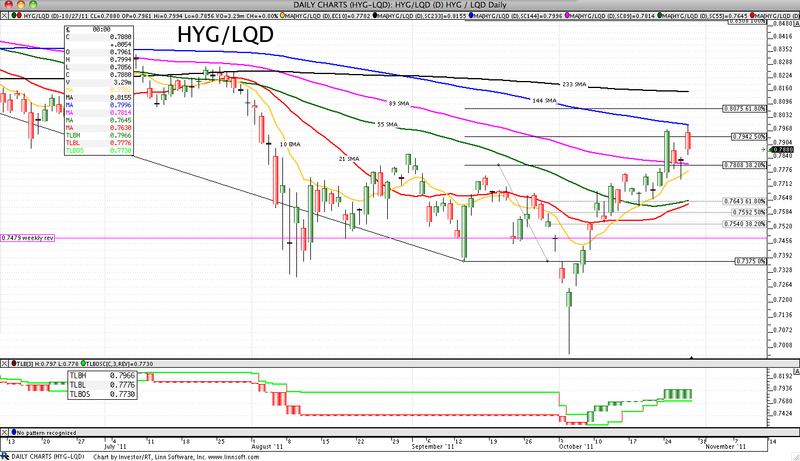 Holding above its 61.8% minor retrace (38.43). No daily 3LB changes (reversal is 36.51). Bearish short day (didn't confirm bearish harami). Tested and failed SMA(89). Midpoint above EMA(10). Tested and held its 38.2% retrace (0.7808). No daily 3LB changes (reversal is 0.7730). Bullish short day. Midpoint below EMA(10). Failing all SMA's. Tested and held its 50.0% retrace (75.805). No daily 3LB changes (reversal is 76.27). BOJ losing sleep again. Spinning top day. Tested and held SMA(89). Midpoint above EMA(10). Tested and failed its 50.0% retrace (4804.88). No daily 3LB changes (reversal is 4699.84). Sunday Post: Don't Pitch to Pujols Ed.